Welcome to Flaherty Performance Horses online home! Please browse around and check out the wide variety of services they have to offer. 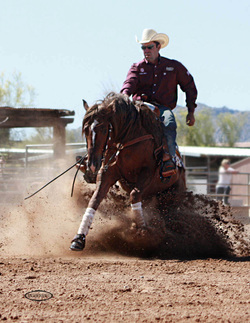 Flaherty Performance Horses is located in the beautiful desert oasis of Scottsdale, Arizona. Owned and operated by Patrick and Janelle Flaherty, their mission is to raise and train quality performance horses. Specializing in Aged Event Reiners and coaching Non Pros, they offer all phases of training from starting a colt to fine tuning your show horse. The Flaherty's believe that there is no substitute for hard work. They autograph all of their work with excellence. They believe in building confidence one ride at a time and with the confidence that is instilled, you'll be hard to beat! Whether you have a futurity prospect or you are a non pro looking to show, Flaherty Performance Horses has something spectacular to offer you! Don't have a horse? Flaherty Peformance Horses can help you with that! Patrick has an "eye" for matching horse with rider. He offers only the highest quality performance horses. He believes that integrity is vital when selling and training horses. To find out more about the great horses he has to offer visit the sale page or give Patrick a call at 480-220-6025.